There has been much made about the Han Solo movie reshoots. And it's been widely reported that director Ron Howard shot way more footage than he was supposed to when he stepped into replace fired directors Phil Lord and Chris Miller last year. Donald Glover, who stars as Lando Calrissian in this Star Wars standalone adventure, was recently touring his second season of Atlanta at the January TCAs, where he candidly opened up about the reshoots. And he had some very interesting things to share. It's more than likely that Glover has been coached by Lucasfilm and Disney on the proper way to handle questions about the reshoot. So hopefully we find that his statements are true. The Han Solo crew is likable and seems trustworthy. But there are some elements we're not likely to learn the truth about before the movie comes out, if ever. Perhaps the most interesting thing Glover has to say is that he didn't change his performance as Lando too much after Ron Howard came aboard. As he tells it. not much changed once the movie switched hands, and he really didn't reshoot too many of his own scenes. Prior to this, not much has been said about Glover's performance, with the real concern being Alden Ehrenreich, whose acting was reportedly deemed too over the top and compared to Jim Carrey in Ace Venture: Pet Detective. It was even said that Enrenreich had to have a Han Solo acting coach come in and show him the ways of the Force. About reshooting his own footage, Glover was asked how much had to change and if he was involved in a lot of the new footage. Reports claim Lord and Miller were nearly finished with their version of the film. Glover offers this about how much new footage he actually shot compared to what has been reported thus far. "Not a ton actually. Not a lot at all, at least not for me. I think we've all never been faced with anything like that and I think he did a good job of coming and tell us he didn't want to change what we were doing at all. He wanted us to remain confident in our vision. He just wanted to sculpt it in a way." 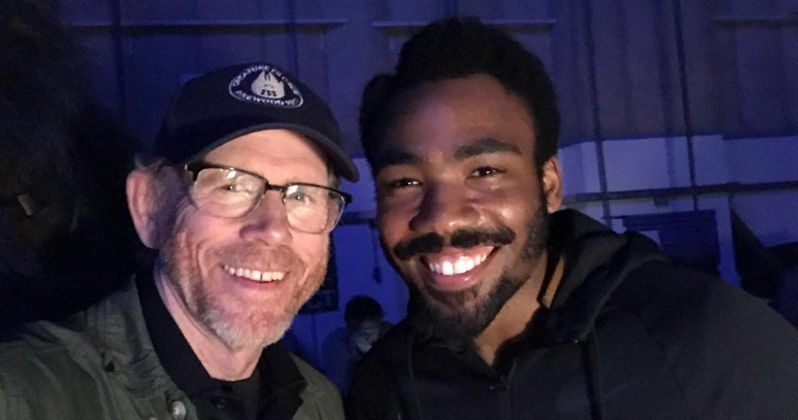 Donald Glover went onto say that Ron Howard was exceptionally generous and supportive of Glover's on set choices when it came to bringing the younger Lando to life, which helped his performance. "It was actually good to get another person on there who was like, 'What do you think of this?' He grew up under Lucas and really is a fan himself." Ron Howard was so much a fan of Star Wars, that he got to pull off a shot of the Millennium Falcon that had never been done before, which wasn't in the playbook passed down from Lord and Miller. And it directly involved Glover's Lando, which the actor was exceptionally excited about. Glover went onto say that Solo was a stress-free environment. Though he doesn't reiterate if it was like that through the whole shoot or just when Howard came aboard. Glover has never spoken ill about Lord and Miller's time on set, and seems to have enjoyed working with all three directors equally. He goes onto say this. "I didn't have a lot of stress on it. For the first time in a long time, I was just acting. That doesn't happen a lot. Most of the time I have to write, do music, a bunch of other stuff. You wake up you go do a bunch of things. This time I woke up and I got to just really be someone else. The stress wasn't there for me." Donald Glover ended his talk about Han Solo reshoots by telling a story about bringing his dad to the set, which was very exciting for him. He then confirmed that yes, Lando Calrissian will be wearing his iconic cape in the next Star Wars Story. Which should be pretty cool when we finally get to see it. /film was the first to report on Donald Glover's new insight into the Han Solo reshoots.